This thread is now closed. If you want to DISCUSS Realism Overhaul or how to use Realism Overhaul then go HERE. If you want the CURRENT Realism Overhaul thread, go HERE. Closure, added link to new thread. And so it reverts to the stock sized Kerbin system. That is an RSS error. Download the latest, remove existing RealSolarSystem folder, then install latest. Hodo: (a) that really kinda goes in the RSS thread, but ( then that file doesn't exist or is unreadable. Make sure that in fact you have GameData/RealSolarSystem/Plugins/PluginData/EarthHeight.png (and also EarthColor.png and EarthNRM.png). If not, then you did not install RSS fully; redownload from the RSS OP and reinstall. Will try for the 4th time... never know. Maybe a corrupt file on download. Make sure you are downloading from the OP the full package; if you're downloading that prerelease I just posted, the "codeonly" in its filename should warn you that it does not include textures. By the way, would you guys mind if at some point in the unspecified future, I forked RO to create a 'realistic but still Kerbally' version? Well that was a bit of a scare! I typed up a reply in the old thread and tried to post it to be told the thread was locked lol. Yes, with v6.0 which introduces TweakScale, fuel tanks are also done, from .5m to 5m. Now, obviously nothing is ever 'DONE' because it can't be if KSP itself isn't, but the answer to that question is yes, way more parts are included with the 'generic packs' than before. If there is something specifically missing, please let us know. So today I played around with TweakScale. I like it! I think this is a good route. TweakScale is, IMHO, so much better than Procedural* because it retains the nicer models and textures of the original part. It also lets me control what scales are allowed based on tech. There are some good things, but not everything quite works as it should, however Biotronic is working on some good things to make it even better. FYI...The RO GitHub (still in the same place:)) is now in 6.0 alpha stage...not an official release yet, but feel free to play around with it. Well...it was accurate how I meant it...being that it was still NathanKell/RealismOverhaul, I had forgotten the v6 branch was there, deleted it:) that was never truly updated to 6.0 anyway...We'll let everyone know when 6.0 goes official. Is there a document that lists all the engines modified for Real Engines? I'm trying to work out a technology timeline based on real world introduction, and i'm just curious if a list exists before I make one. On the old RO thread post 220 something was the latest SFJackBauer RealEngine post. It has a spreadsheet. Awesome thanks. That will save me some time. Although i'm still wrestling with the best way to tech restrict engines. I mean, date of the technology doesn't really mean a whole lot. The F-1 engine for example is still one of the most powerful engines ever built yet it was in the infancy of the space age. EDIT: Then again newer engines are more efficient, if less powerful. Actually I just had an idle thought (though I need to research it more), but it seems to me that most of those early launch vehicles were built to a different design philosophy. One of big huge powerful engines, but no SRBs. Modern launch vehicles use SRBs to provide the sea level TWR to get off the ground, and the engines while less powerful are more efficient overall. So is this the new RO thread? Are you its maintainer now? I'll play around with the 6.0 prerelease when I get the time, FO: New Vegas is eating all of it. Never mind, I read the old thread now. Can someone point me in the right directions ? Where did I mess up ? Update: only liquid fuel tanks are invisible... the two SRBs are ok.
Update2: procedural fairing bases are also missing but the actual fairing part is ok.
By the way. This is a bug, due to clashing configs from "Probes_AIES.cfg" and "RT2_RO.cfg", or feature? Don't think it's a bug. Are you in sandbox? It might be because in the early career it has 3km range which later gets upgraded to 100km. There's something similar in stock RT2 AFAIK. Don't think it's a bug. Are you in sandbox? So, now all other parts are rescaled to the new size system and will fit each other nicely and I do not have to comment anything in the configs anymore, correct? And what about the capsule interiors? Are they rescaled to this size too? That is quite annoying to look out of the window and see the parts of the exterior out there not aligned with the interior. 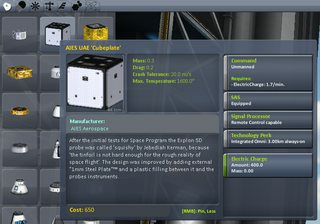 I have heard of idea of making kerbals themselves human sized. Maybe it was somwhere in the old thread recently. How could this possibly be done? Part of your issue is that with RO and RF, it removes some of the Procedural Tanks and just gives one, you'll need to unlock some more. This was a bug, was not intended to do that. It has been fixed as part of 6.0. It was due to parts being modified in multiple places with the old RO, RO 6.0alpha resolves this issue by combining all fixes for one part into one place in one file instead of being spread out like it was. Not exactly sure what answer you want here??? What parts and interior are scaled how, why? 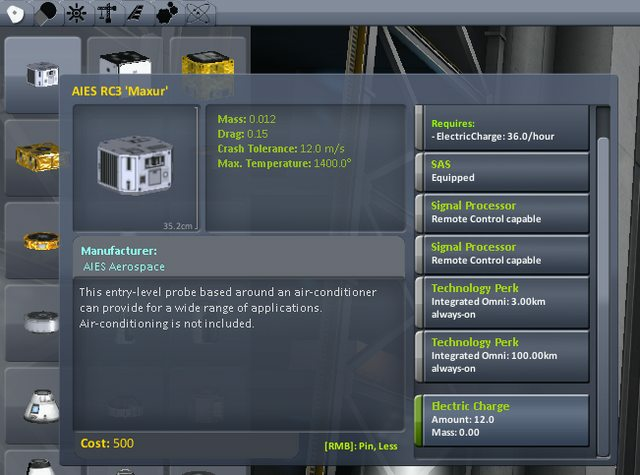 Kerbal resize part of RSS I'm guessing, could be wrong NK would know those details. Thank you for the quick reply ! Please read further, it was a bug, it's been fixed.